SAMK organises an event in the framework of the ‘Science meets Regions’ pilot project. The event will be held on 26 September 2019. The event will be hosted at SAMK Campus Pori, Satakunnankatu 23, Finland. 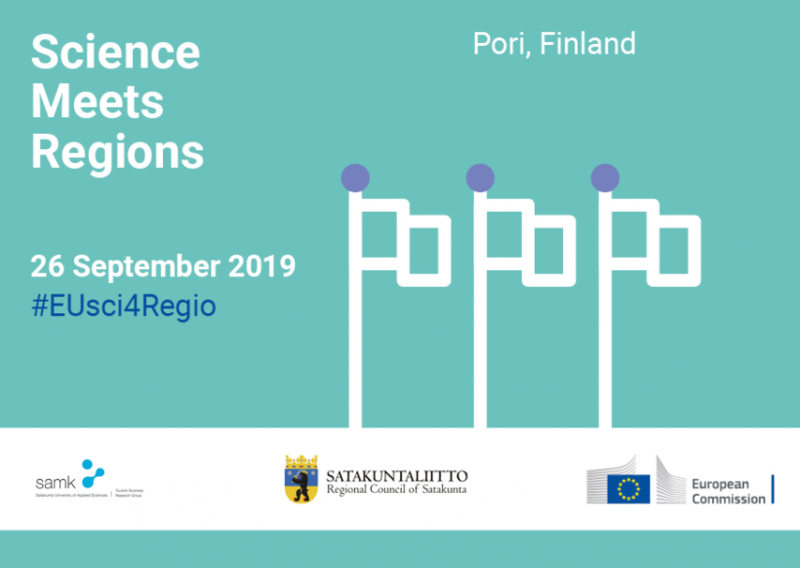 Satakunta University of Applied Sciences (SAMK) organises an event in the framework of the ‘Science meets Regions’ pilot project, funded by the European Parliament. The topic of the event is coastal and maritime tourism as Blue Growth is one of the most important emerging themes in the regional development. Coastal and maritime tourism represents a major economic asset for the region, but also entails significant social and environmental consequences in the long-term. The event will discuss ways to develop the sector in a sustainable way. The event is organised in close cooperation with the Regional Council of Satakunta, the Joint Research Centre (JRC) of the European Commission and the Foundation for European Sustainable Tourism. The objective of the event is to build closer links between scientists and EU policy makers, in order to promote a culture of evidence-informed policymaking. This event gives local scientists the opportunity to present their work from various perspectives and policymakers to communicate their needs and explain their priorities on the topic. Relevant scientific research, policy examples and best practices will be presented and discussed. In order to formulate effective tourism policies, a holistic European approach is needed taking into account the multiple impacts of coastal and maritime tourism as well as the wide spectrum of stakeholders involved or affected by tourism. The event welcomes local, national and international stakeholders representing tourism, environmental protection, natural and cultural heritage, planning and management, research and policymaking. 09:15 Keynote: Can sustainable tourism development save the world? The event is moderated by Rita Strömmer, the journalist and correspondent covering news events world-wide. The event will be held on 26 September 2019 and is hosted at Satakunta University of Applied Sciences, Finland. The day programme is held in SAMK Campus Pori, Satakunnankatu 23. Arriving by plane: Most international flights to Finland arrive at Helsinki-Vantaa airport. Turku and Tampere are also possible destinations and are located near Pori. Arriving by train: There are train connections between Helsinki-Vantaa airport and Pori. For detailed timetables and price information, please visit the webpage VR. Arriving by bus: There are direct connections between Helsinki city centre and Pori. For detailed timetables and price information, please visit the webpage Matkahuolto. For hotel reservations, we recommend using Hotel Bepop, which is located in proximity to the campus. We have special arrangements with the hotel. The room price is 85 eur/single room and 99 eur/double room including breakfast (booking code: Science meets Regions, prices valid until 4 September 2019, bookings bepop@hotelbepop.fi). The event is free of charge. The social evening programme is by invitation only. Participants will cover their own travel and accommodation expenses. Registration form will open soon. Registration is required for all participants. Limited number of seats.